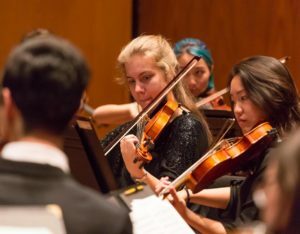 The Joint Music Program of Claremont McKenna, Harvey Mudd, Pitzer, and Scripps Colleges offers opportunities for music study and performance to music majors and other interested students. The Joint Music Program currently sponsors three ensembles, the Claremont Concert Orchestra, the Claremont Concert Choir, and the Claremont Treble Singers. Qualified student members from all of the Claremont Colleges are welcome to join. The liberal arts ideal of music as an integral part of the general curriculum is evidenced by students receiving academic credit for participation in large music ensembles as well as for applied lessons. Working in a supportive, intimate environment, students find studying and performing music at The Claremont Colleges a stimulating and productive means of personal and artistic fulfillment. In addition to large ensemble performance courses, the Joint Music Program frequently offers Music 81, Introduction to Music, a music appreciation class which focuses on Western musical traditions, and Music 3, Fundamentals of Music, which covers music notation and basic music theory. These courses are taught by Joint Music professors or associated music faculty. Joint Music faculty also offer courses in the Scripps College music department, including music theory, music history, and music elective courses, all of which demonstrate our advocacy of interactive, seminar-style teaching. For audition information, please see the pages for the appropriate ensemble, or the page of links. For information about lessons, click here.